On Saturday 7 May 2016 Green Building Store Director Chris Herring joined environmental campaigners from across West Yorkshire to march backwards in Leeds and calling on the UK Government to stop backtracking on climate change policies. 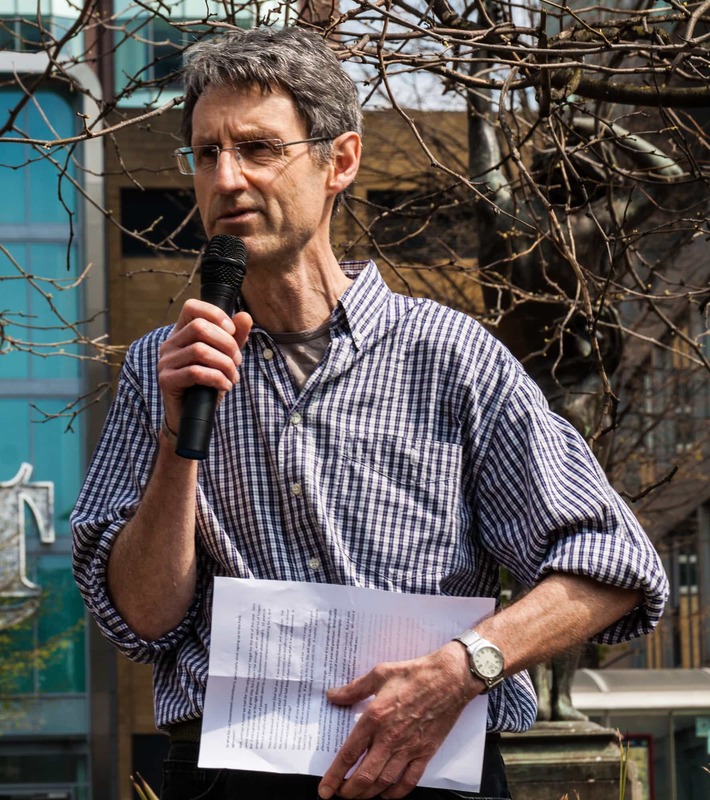 Chris was one of a number of speakers at the rally following the ‘Forwards not Backwards’ march, who included environmental campaigners, local politicians, academics and local business leaders. Extracts from Chris’s speech appear below. Buildings, in construction and in use, account for around 40% of our energy use and CO2 emissions in the UK. We need low carbon energy sources of course, but the greatest potential for CO2 emission reductions is in energy efficiency. It’s not difficult to make our new buildings highly energy efficient. Buildings have been constructed to the international Passivhaus standard for over 20 years. There are over 80,000 worldwide and over 1000 in the UK now. And they work. Passivhaus buildings give us 90% reduction in space heating energy. But, better than that, truly energy-efficient buildings are more comfortable than conventional new buildings. And they are healthier. So they are win-win-win. So we can build energy efficient buildings right now and lots of places are already doing that and leading the way. Brussels region went all Passivhaus in January 2015, many German cities and regions are committed to Passivhaus, Manhattan has just committed to Passivhaus, Vancouver is going Passivhaus. 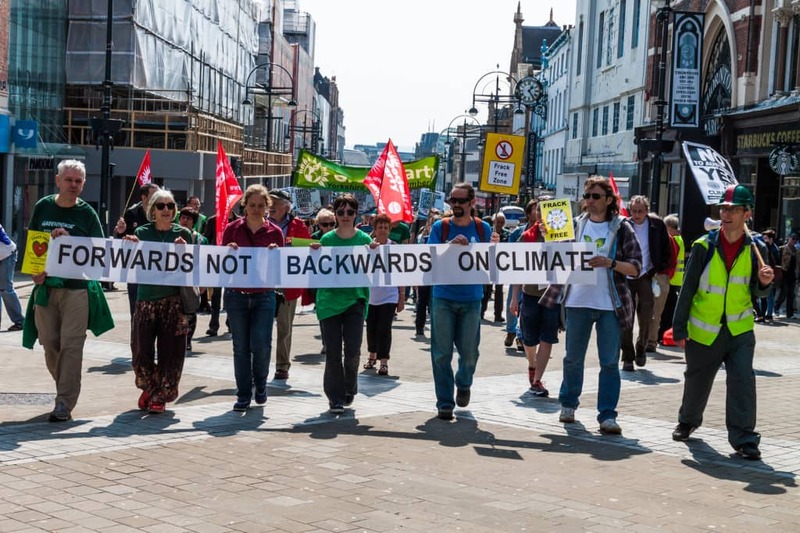 Back here in the UK, Exeter council is committed to Passivhaus, Norwich council is committed to Passivhaus, Bristol council has just decided to build Passivhaus, Kirklees is looking at Passivhaus. We can also deep retrofit our buildings to similar levels of efficiency. There are many Passivhaus retrofits around the world, including here in the UK. Its not quite so easy, but its doable. And it is something we need to start doing and something we need to start investing in now. Big time. To do it, the construction industry needs two things. 1. Clear and progressive targets. 2. A realistic , reliable and stable roadmap to upskill and develop supply chains. You simply cannot achieve these things with constant change and ridiculously foreshortened timescales. What is the Government doing about energy efficiency ? So what has our Government committed to, particularly since signing up to the Paris agreement? Well, until last Autumn we had the ‘zero carbon homes’ target for the end of 2016. Zero carbon homes sounds like a great step, but it wasn’t far enough, with an awful lot of fudges. But it was a great step in the right direction. This Government abandoned it. 10 years in preparation and millions of pounds spent by construction companies preparing for it, and then just abruptly abandoned. They also abandoned the Green Deal last year. It was deeply flawed, and unpopular. Did they replace it with anything else? Thousands of assessors and installers trained to deliver this, and many of them went bust or had wasted their training when it was abandoned. A realistic and stable road map? From January 1 2021 all new buildings throughout the EU will be ‘near zero energy’ buildings. There will be no exceptions. If we are in the EU, this will apply to us. I have just heard that the Government plans to do nothing about this until 2019. A realistic and stable roadmap? We know we need to act right now on climate change. We owe it to people already deeply affected and to future generations. I have a 3 year old grandson. What world will he and future generations face? The consequences of inaction will be catastrophic. We need to take personal action. Now is the time to stand up and be counted. But we also need action from this Government. We particularly need it on energy efficiency. We need it now. So now is the time to stand up and make our voices heard.